When we live, various plants in hills and fields might be seen. Even if the plant understands the one and the name only to see, to know, and not to understand the name, nothing might be understood from it. The ecology of the plant is understood when examining it though a little. We have become knowledgeable about the plants come to life in width. Life will be better to live rich than to know that life without knowing it. 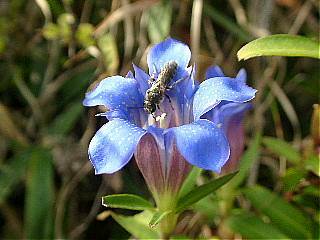 This is a picture of a gentian flower. Gentian is one of the leading flower in autumn. There are a lot not to mow hills, low stature gentian is not getting the growth environment. In Chinese medicine the dried rhizomes and roots are called gentian gentian, very bitter, is used as a bitter stomachic.